The ten students enrolled in the new program are excited to gain access to high quality training at the technician/operator level. They will acquire skills that are transferrable beyond biofuels to a number of industries in the Northwest. 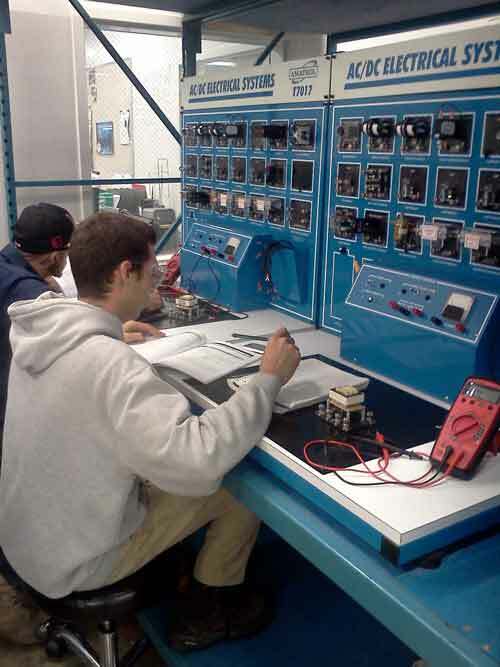 Students focused on an electrical systems lab. The community and technical college-level bioenergy program is administered by the Agriculture Center of Excellence as part of AHB. The first course in the program introduces students to fuel and water chemistry, conversion processes, different forms of biomass, and safety protocols. The next course, offered in January 2014, focuses on established and emerging biorefinery processes that are key considerations for biofuel plants, municipal wastewater treatment plants, industrial food processors, pulp and paper mills, and agriculture processors. This course will include visits and hands-on training at a municipal wastewater treatment plant and a local ethanol fuel production facility. Starting spring 2014, students will take a course on biorefinery equipment where they will gain working knowledge of the core equipment used to control and operate processes and maintain operations with a high degree of efficiency. Labs will focus on hands-on training in process level and flow control. Students will visit a food-grade canola oil production facility and combined heat and power generation (cogeneration) plant. 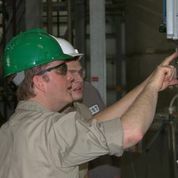 Students visit Pacific Ethanol-Columbia in Boardman, OR. Four additional bioenergy courses will round out the second year of the program, including biorefinery operations, biomass feedstock management, bio-chemical conversion, and thermo-chemical conversion. By the end of the program, students will have formal training in safety, electricity, process controls, biofuels, biology, chemistry, agriculture, and operations. Graduates will be prepared for industrial, municipal, and agricultural jobs as operators and technicians producing electricity and heat (cogeneration), transportation biofuels, biogas, process steam, clean water, and other high value products and chemicals. All seven of the new bioenergy courses will be offered on campus and have an online option available for distance learning. Distance learning may be especially beneficial for people working in the industry who have continuing education interests or requirements. Online courses are also necessary so students at other Pacific Northwest community and technical colleges can enroll in the Bioenergy Operations Program. Supporting courses draw from existing programs in heating and ventilation, electrical systems, water management, agriculture, chemistry, biology, English, math, and engineering. As part of the new Bioenergy Operations Program, several certificate and degree programs that are currently offered include an associate of applied arts and sciences degree in bioenergy operations; a certificate in bioenergy operations; a short certificate series in processes, operations, and chemical conversion; and a certificate in biomass feedstock management. Currently in development is an associate of applied sciences transfer degree in bioenergy operations for those wishing to pursue an undergraduate or advanced degree at Oregon State University, the University of Washington, or other institutions in the region. Regardless of the pathway taken, graduates of the Walla Walla Community College Bioenergy Operations Program will be instrumental in moving the Pacific Northwest toward cleaner, more efficient and sustainable energy future. Visit the Walla Walla Community College Website for more information.